A scared Peter denies Jesus while Jesus is getting humiliated and falsely accused by the Sanhedrin. The rooster crows and Peter discovers that boastful words carry little weight. Let's see what happens when a believer denies his Lord. Please read Mark 14:66-72 before starting GraspingGod.com's free Bible study lessons, #3.08. 1) Did Peter's fellow disciples also deny Jesus at one point? 2) How was Judas' betrayal different from Peter's denial of Jesus Christ? 3) What was the difference between Judas' regret and Peter's repentance? Hey there! Thanks for joining me. Grab yourself a cool drink and let's discuss more details leading up to Jesus on the cross. There is a lot to learn about ourselves from Peter's lack of faith. 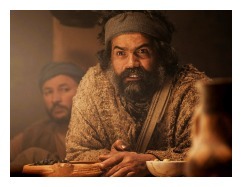 Find out what happens after Peter denies Jesus three times. 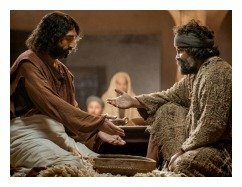 Earlier in the evening of Jesus' arrest, during Jesus' last supper, he stated that Peter would deny him a total of three times (Matthew 26:34-35). The apostle Peter loudly defended himself, "No! Even if I have to die with you, I will never deny you!" All Jesus' 12 disciples vowed the same as Peter. 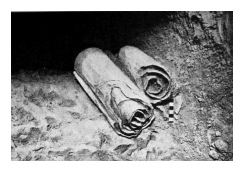 Within hours of the meal, Jesus was being arrested in the olive grove in Jerusalem. Peter boldly fought for Christ by swinging his sword at the lowly servant, Malchus (Matthew 26:51-52). Peter, still feeling perturbed from Christ's predictions of disloyalty, obviously acted out his bold claim. Jesus stopped the aggression, allowing the arrest to take place peacefully. 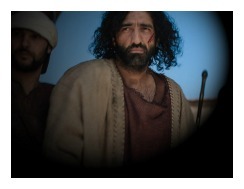 Jesus then fixed Peter's damage by healing Malchus' ear. Jesus' healing of the servant's ear was a miracle. A miracle in the midst of an unjust arrest - the Captive healing the captor! Amazing. In spite of that powerful display of God's power and grace through Jesus, the disciples quickly fled from their Master during his time of need (Matthew 26:56). The disciples failed to trust in God. Their Master didn't run in fear and they shouldn't have run either. Jesus trusted his Father's sovereign plan and the disciples should have followed Christ's lead. Jesus didn't fear man, nor should the disciples have feared man. The temporary disengagement between Jesus and his disciples had begun. Most of them wouldn't see Jesus again until after his resurrection. 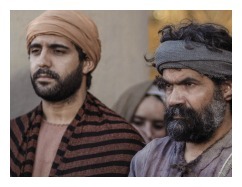 Jesus' disciples, fleeing the scene of Jesus' arrest, could be viewed as another prediction in which Peter denies Jesus. To Peter's credit, though, he stealthily followed the mob after they arrested Jesus (Matthew 26:58). Keep in mind that this situation was prophesied hundreds of years before. God spoke through his prophet Zechariah, "Awake, O sword, against my Shepherd, the man who is my partner," says the LORD of Heaven's Armies. "Strike down the Shepherd, and the sheep will be scattered, and I will turn against the lambs." (Zechariah 13:7). God's plan helped preserve the disciples from harm. Their fear of persecution led them to flee captivity. God didn't want them held behind bars yet, because these men were predestined to change the world with Jesus' gospel of peace. Their time had not yet come. Jesus' disciples' fear of persecution was used by God to preserve them for the furtherance of his gospel. The boastful Peter told Jesus he would never, ever deny him. He had confidence in himself. He was physically strong - a fighter. If his Master was going to suffer, Peter would suffer with him. If his Lord was going to die on a cross, Peter would die on a cross. Personal pride in himself fed Peter's macho desires. Unfortunately for Peter, the severity of the situation met him head-on. He watched as Jesus was interrogated in the middle of the night. Peter witnessed Jesus meekly refusing to defend himself. Jesus could have easily been released if a fair trial was conducted. Peter heard Jesus claim divinity before the high priest, Caiaphas, who broke into a rage. The court immediately convicted Jesus of blasphemy, which meant a death sentence. The beating and mocking commenced and Peter was beside himself with rage. They were taking away his beloved Master. Peter's heart was broken, feeling alone like never before in his life. The distraught Peter was absorbing this entire scene, undoubtedly figuring a plan to free his Master. A servant girl though, approaching him, says, "You were one of those with Jesus the Galilean" (Matthew 26:69-70). In front of a large crowd, Peter denigrated the little girl, telling everyone she was wrong. Peter denies Jesus once. Peter continued his hyper-focused witness of the mob brutality against Jesus. He was consumed by his despair. Strangely, a servant girl, again, approaching him, says, "This man was with Jesus of Nazareth." (Matthew 26:71-72). Peter got annoyed this time. Couldn't she see what was going on here?! Can't people leave him alone while he watches the fate of his Master unfold?! Peter explodes, "I don't even know the man!" Peter denies Jesus twice. Finally, Peter distanced himself from these annoying pestering girls. He was intently watching the guards lead his Master to Pontius Pilate, where he would stand trial for the capital offense of blasphemy. It was a horrific scene. Unimaginable. Jesus was sinless! How could this be happening? 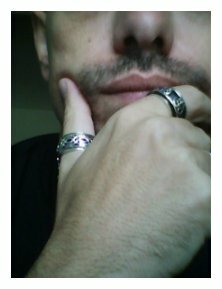 Lo and behold, here again, some people from the crowd accused him, "You must be one of them; we can tell by your Galilean accent." (Matthew 26:73-74). Peter angrily swore, "A curse on me if I'm lying - I don't know the man!" Peter publicly swore by God in heaven that he didn't know Jesus. In other words, he called upon God to curse him if he was lying. Peter denies Jesus a third time! As Peter turned in disgust from the crowd, a rooster crowed. Jesus' words from earlier that night struck Peter like a lightning bolt, "Before the rooster crows you will deny three times that you even know me." Shock sets into Peter's mind. His conscience was seared. The rooster's crow had barely dissipated into the air when Jesus peered, eyeball to eyeball, into Peter's soul (Luke 22:61). Oh, the shame and utter humiliation before the Master! Peter let his beloved Lord down. He knew what he did to his Master was harder on Jesus than what the Jewish leaders and guards were doing to him. Betrayal by a friend hurts much more than unjust treatment by haters. Peter denies Jesus three times. The disciple Peter denies Jesus Christ, his Master - three times. Three times! How could this be true? The previously proud, bold and confident Peter got angry at the suggestion that he would deny Jesus. And yet, here he finds himself - guilty. Peter denies Jesus. He denies his Messiah. Peter's soul is mortified. He realizes the depths to which he cowardly sunk. Was he as bad as Judas?! How could it be? The disgrace fell upon Peter, becoming so heavy he crouched to his knees. He cries bitterly. Peter was ashamed and suddenly oblivious to the trial. Remorse sets in immediately. These were the first tears of true repentance. Peter fell victim to his own human fear. He sinned. He swore, with God as a witness that he didn't know Jesus. He lied, calling God as a witness! He cowardly shrunk away from persecution. Jesus' soul-piercing stare convicted him. The guilt was laid heavy upon Peter. Shame led most of the disciples underground during the next two days. The only disciple we know for sure who viewed Jesus' crucifixion was John. They had all, to varying degrees, abandoned their Master. One of them, Judas Iscariot actually sold his own soul for 30 pieces of silver! Embarrassment for their cowardice set in, so they scattered off, hiding in fear, hiding in shame, sheltering themselves from the angry mobs. What next? The result of the disciple's cowardice was God's will. We can't justify their actions and we're not. However, God used their fear to protect them from the mobs. The disciples scattered, as Zechariah said they would. They were now safe - cowardly sinful - but safe and preserved for their future mission. At this point, though, this was a saddened group of young men who lost their Shepherd. Their beautiful Savior was tortured, now convicted and hanging on a cross. What happened? Grief set into their hearts. 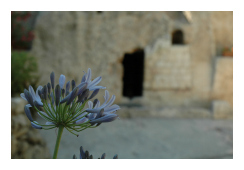 Jesus' disciples rejoiced when they heard the news that Jesus rose from the dead! Sunday morning came and the Son had risen! Jesus rose from the dead, and his tomb was empty! The disciples would see him shortly. In the meantime, their tears, fears and shame turned into smiles, hope and strength! Their Master had returned, just as he said! In the coming days and weeks, Jesus would rebuild the faith of all these disciples, sans Judas Iscariot, who killed himself. Jesus would give them final instructions and he would also open their minds to the word of God (Luke 24:45). Finally, Jesus would ascend to his rightful throne in heaven, so he could send them the Holy Spirit. The sin of Judas was far worse than the sin of Peter. Judas' kiss was far worse than the disciples fleeing from the scene of Jesus' arrest. Judas sold Jesus to his enemies for 30 pieces of silver! He traded God for a few bucks. Judas was a brazened traitor who maliciously set up his Master for arrest and eventual death. A person can't get much more despicable than Judas - whose sin was the ultimate of all betrayals. Peter, on the other hand, didn't collaborate with Jesus' enemies. Peter denies Jesus, yes, but he didn't hurt the standing of Jesus. Peter denies Jesus, yes, but his denial of knowing Jesus brought no further harm to Jesus' immediate situation. Peter's sin was not malicious, it was cowardice. It was public, though, and something that haunted Peter throughout his lifetime. The piercing eyes of Jesus' judgment never left Peter's mind. Guilty as charged. Jesus' disciples all fled from the scene in the olive grove when Jesus' arrest was taking place. Again, as with Peter, there was no evil intent - only cowardice. They didn't necessarily deny Jesus at this point, but it could be considered abandonment. Personally, I can't fault them here in this situation. It was an ugly scene and Peter, after all, did put up a fight! Jesus had the situation under control, though, and it appears the disciples knew this. Jesus also told his captors to free his disciples. Judas expressed only earthly sorrow for his disgusting sin (2 Corinthians 7:10). He only humanly regretted what he did, falling short of godly repentance. Upon Satan leaving Judas' body, Judas could humanly grasp what he did to Jesus. He realized that his betrayal was the most terrible of crimes. Judas knew there was no hope to live the rest of his life in the condemned condition, so he killed himself. He tried escaping the inner turmoil through death. The overwhelming guilt, convicting his conscience, led him to hang himself. A person can't flee the ramifications of their sin, even through death. Death only ends physical life, not the existence of your soul. Judas' sin will follow him to judgment day and eternal punishment. Peter's remorse was a godly repentance. Peter was full of shame, regret, remorse and self-hatred for his sin. It brought him to the point of bitterly weeping for the harm he caused to Jesus' heart. Peter's denial hurt his friend, his Master, and he was sorry for the pain he caused him. If Peter could go back in time, by changing his actions, he most certainly would. He was humbled under the massive weight of the betrayal of his Lord. He undoubtedly begged for forgiveness many, many times. Peter was forgiven by God for his cowardice and lying. True repentance opens the door to God's mercy and forgiveness. We MUST follow Peter's example of repentance towards Christ. We MUST humble ourselves for our original sins of betrayal against him. God uses every situation to further the knowledge and wisdom of those who love him. Look at all the incredible insight we can gain from studying the biblical records of his disciples. In today's lesson, we can learn about true devotion as a disciple of Jesus. One disciple was lost, collaborating with Satan to sell Jesus down the river. The boldest of disciples, Peter, hours after professing his amazing support of Jesus, swore to God that he never knew Jesus. 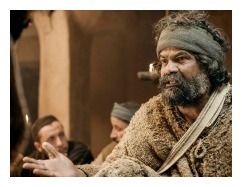 Peter denies Jesus - THREE times! Wow! By the grace of God, though, one of the two weak disciples fell to his knees in true repentance, becoming one of the greatest Christians in history. The other was so miserable that he grabbed a rope to end his sad life, instead of facing up to his crime. Like the two criminals on the cross, one disciple rose to live with Christ forever, by faith; but, another disciple descended to hell, by lack of faith. Faith in Jesus ALONE is what saved Peter. Believe in Jesus, my Friend. That's the most important command to us all (John 6:29). Next lesson: Jesus Before Pilate #3.09. 1) Has a friend ever betrayed you? What emotions were triggered by the betrayal? How do you think Jesus felt about Peter's denial? Did you forgive your friend who betrayed you? 2) How does earthly sorrow lead to death, but godly sorrow lead to repentance? 3) How can Peter's story of denial and repentance lead you to a stronger faith? Praise be to the God and Father of our Lord Jesus Christ! In his great mercy he has given us new birth into a living hope through the resurrection of Jesus Christ from the dead, and into an inheritance that can never perish, spoil or fade — kept in heaven for you, who through faith are shielded by God’s power until the coming of the salvation that is ready to be revealed in the last time. In this you greatly rejoice, though now for a little while you may have had to suffer grief in all kinds of trials. These have come so that your faith — of greater worth than gold, which perishes even though refined by fire — may be proved genuine and may result in praise, glory and honor when Jesus Christ is revealed. After sharing this Bible study lesson on Facebook or Twitter below download your FREE printable Bible Study Lessons (pdf version): Peter Denies Jesus, Lesson 3.08. Please Donate To GG.com! Special Note: I'm grateful to Big Book Media & Free Bible Images, Stock Exchange, Morgue Files, and Stock Photos For Free for the use of their photos for Peter Denies Jesus Bible study lesson.